The Atlantic white-sided dolphin (Lagenorhynchus acutus) is a distinctively coloured dolphin found in the cool to temperate waters of the North Atlantic Ocean. The Atlantic white-sided dolphin was named by John Edward Gray in 1828. The specific name acutus comes from the Latin for 'pointed' and refers to the sharply pointed dorsal fin. L. acutus is one of six oceanic dolphins in the genus Lagenorhynchus. The dolphin is slightly larger than most other oceanic dolphins. It is just over a meter in length at birth, growing to about 2.8 m (9.2 ft) (males) and 2.5 m (8.2 ft) (females) at maturity. It weighs 200–230 kg (440–510 lb) once fully-grown. Females reach sexual maturity at between 6 and 12 years, and males between 7 and 11 years. The gestation period is 11 months and lactation lasts for about a year and a half — both typical figures for dolphins. Individuals are known to live for up to 22 years (males) and 27 years (females). The key distinguishing feature is the white to pale yellow patch found behind the dorsal fin of the dolphin on each side. This colour variation is unique amongst the mixtures of white, greys and blues of other pelagic cetaceans. The rest of the body's coloration is well demarcated: the chin, throat and belly are white; the flippers, dorsal fin and back are dark grey to black with the exception of the yellow patch; there is a further white patch below the dorsal fin, lying above a light grey stripe that runs from the beak, above the eye and down to the tail stock. Dolphin group sizes vary by location, with groups averaging 60 in number close to the Newfoundland shores, but rather smaller east of Iceland. From the analysis of the stomach contents of stranded animals, fish such as herring and mackerel and squid appear to form the species' main diet. The Atlantic white-sided dolphin is fairly acrobatic and keen to interact with boats, however it is not as wildly gregarious as the white-beaked and common dolphins. Like all species of the dolphin family, Atlantic white-sided dolphins are very social animals. Often traveling in large pods and display aerial behaviors as they travel. Despite being docile creatures, even known to interact with various species of cetecean in a nonviolent manner, most notably with the long-finned pilot whale (Globicephala melas), they have also been known to display violent behavior towards harbor porpoises, attacking them until they eventually succumb to their wounds, a similar behavior observed in bottlenose dolphins. Atlantic white-sided dolphin calves are known to swim in the echelon position with their mothers. 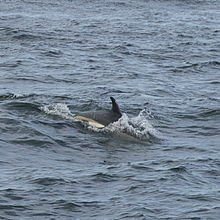 A case of a female Atlantic white-sided dolphin raising two calves was observed back in the summer of 2002, the causes of this behavior are still unknown. While these animals are not seen in captivity all when compared to species like the bottlenose dolphin, behaviors in aquarium setting have been observed. After being studied for over a period of 42 hours, the study revealed that these lesser known species of dolphin display a high number of social behaviors. The species is endemic to the North Atlantic Ocean. Areas of particularly high population density include the shores of Newfoundland and Cape Cod, the triangular area of sea between the United Kingdom, Iceland and Greenland and the North Sea. The total population is believed to be 200-300,000 individuals. In 2008, sightings of Atlantic white-sided dolphins as well as the Melon-headed whale were documented in South Carolina after a few stranding had taken place in the area at the time. Historically, Atlantic white-sided dolphins were killed in drives conducted from Norway and Newfoundland. These have ceased in recent years, although they still occur to a lesser extent from the Faroe Islands, where the meat and blubber are in high regard as food. Reported catches in the years from 1995 to 1998 were 157, 152, 350, and 438, respectively (Bloch and Olsen 1998, 1999; Bloch et al. 1997, 2000). In 2002, the number reported killed was 774. Most years, no dolphins are killed, only to have individual years suddenly stand out, such as 2017 when several small pods were killed, after an 11-year period with no dolphins killed north of the southernmost island. The North and Baltic Sea populations of the Atlantic white-sided dolphin are listed on Appendix II  of the Convention on the Conservation of Migratory Species of Wild Animals (CMS). They are listed on Appendix II as they have an unfavourable conservation status or would benefit significantly from international co-operation organised by tailored agreements. These species of dolphin are known to fall victims to in a polluted environment, a study from 1997 confirmed that the British and Irish populations of Atlantic white-sided dolphins to succumb to these effects. In addition, the Atlantic white-sided dolphin is covered by the Agreement on the Conservation of Small Cetaceans of the Baltic, North East Atlantic, Irish and North Seas (ASCOBANS). ^ Hammond, P.S. ; Bearzi, G.; Bjørge, A.; Forney, K.; Karczmarski, L.; Kasuya, T.; Perrin, W.F. ; Scott, M.D. ; Wang, J.Y. ; Wells, R.S. ; et al. (2008). "Lagenorhynchus acutus". The IUCN Red List of Threatened Species. 2008: e.T11141A3255721. doi:10.2305/IUCN.UK.2008.RLTS.T11141A3255721.en. Retrieved 16 January 2018. Database entry includes a brief justification of why this species is of least concern. ^ Cipriano, F. (2002). Atlantic white-sided dolphin Lagenorhynchus acutus. Encyclopedia of marine mammals. San Diego, California: Academic Pres. pp. 49–51. ^ "Atlantic White-Sided Dolphin (Lagenorhynchus acutus)". NOAA Fisheries. ^ Weinrich, M.T. ; Belt, C.R. ; Dorin, D. (2001). "Behavior And Ecology Of The Atlantic White-Sided Dolphin (Lagenorhynchus Acutus) In Coastal New England Waters". Marine Mammal Science. 17 (2): 231–248. doi:10.1111/j.1748-7692.2001.tb01268.x. ^ Baraff, L. S.; Asmutis-Silvia, R. A. (1998). "LONG-TERM ASSOCIATION OF AN INDIVIDUAL LONG-FINNED PILOT WHALE AND ATLANTIC WHITE-SIDED DOLPHINS". Marine Mammal Science. 14 ((1)): 155–161. doi:10.1111/j.1748-7692.1998.tb00700.x. ^ Larrat, S.; Measures, L.; Stephane, L. (2012). "Short Note Rake Marks on a Harbor Porpoise (Phocoena phocoena) Calf Suggestive of a Fatal Interaction with an Atlantic White-Sided Dolphin (Lagenorhynchus acutus)". Aquatic Mammals. 38 (1): 86–91. doi:10.1578/am.38.1.2012.86. ^ Ross, H.M.; Wilson, B. (1996). "Violent interactions between Bottlenose dolphins and Harbour porpoises". Proceedings of the Royal Society B: Biological Sciences. 263 (1368): 283–286. doi:10.1098/rspb.1996.0043. ^ Simard, P.; Gowans, S. (2004). "Two Calves in Echelon: An Alloparental Association in Atlantic White-Sided Dolphins (Lagenorhynchus acutus )?". Aquatic Mammals. 30 (2): 330–334. doi:10.1578/am.30.2.2004.330. ^ Nelson, D. L.; Lien, J. (1994). "Behavior patterns of two captive Atlantic white-sided dolphins, Lagenorhynchus acutus" (PDF). Aquatic Mammals. 20 (1): 1–10. Retrieved 15 February 2017. ^ Schevill, W. E. (1956). "Lagenorhynchus acutus off Cape Cod". Journal of Mammalogy. 37 (1): 128–129. doi:10.2307/1375559. JSTOR 1375559. ^ Mckenzie, C.; Rogan, E.; Reid, R.; Wells, D. (1997). "Concentrations and patterns of organic contaminants in Atlantic white-sided dolphins (Lagenorhynchus acutus) from Irish and Scottish coastal waters". Environmental Pollution. 98 (1): 15–27. doi:10.1016/s0269-7491(97)00109-7. PMID 15093341. ^ Powell, J.W. ; Rotstein, D.S. ; Mcfee, W.E. (2012). "First Records of the Melon-Headed Whale (Peponocephala electra) and the Atlantic White-Sided Dolphin (Lagenorhynchus acutus) in South Carolina". Southeastern Naturalist. 11 (1): 23–34. doi:10.1656/058.011.0102. ^ a b "Appendix II Archived 11 June 2011 at the Wayback Machine" of the Convention on the Conservation of Migratory Species of Wild Animals (CMS). As amended by the Conference of the Parties in 1985, 1988, 1991, 1994, 1997, 1999, 2002, 2005 and 2008. Effective: 5 March 2009. ^ Tuerk, K. J. S.; Kucklick, J. R.; McFee, W. E.; Pugh, R. S.; Becker, P. R. (2005). "Factors influencing persistent organic pollutant concentrations in the Atlantic white-sided dolphin (Lagenorhynchus acutus)†". Environmental Toxicology and Chemistry. 24 (5): 1079–1087. doi:10.1897/04-120r.1. ^ McKenzie, C.; Rogan, E.; Reid, R.J.; Wells, D. E. (1997). "Concentrations and patterns of organic contaminants in Atlantic white-sided dolphins (Lagenorhynchus acutus) from Irish and Scottish coastal waters". Environmental Pollution. 98 (1): 15–27. doi:10.1016/s0269-7491(97)00109-7. PMID 15093341.